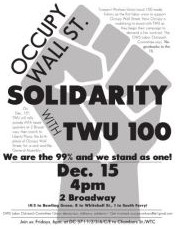 Transport Workers Union (TWU) Local 100 was the first labor union to come out in support of Occupy Wall Street. Now, Occupy Wall Street Labor Outreach Committee is mobilizing #OWS to stand in solidarity with TWU as they begin their campaign to demand a fair contract. On December 15th at 4pm, TWU will rally outside MTA headquarters at 2 Broadway, then march to Liberty Plaza for a rank-and-file General Assembly. Checkout the facebook page for more details. solidarity with the working man / and woman of course. This is the kind of inter-cooperation that is necessary to build this movement! Cheers! This is exactly what is needed. Rank-and-file-led unions like the TWU need to be supported. They should be distinguished from other unions, like the SEIU, which are closer to the Democratic Party establishment. The distinction needs to be emphasized, and solidarity extended to the militant rank and file. About time too. Some of the unions have leaders too carried away with their own egos. The Occupy Movement can help the Union Movement a lot. The unions should capture some of the ethos of bygone days and fight for the working man and woman, not just think about their paychecks. Im loving the revolution that we're having because of #OWS but better contracts? We need to get rid of money entirely. And until we get rid of money entirely I suppose we should accept progressively shittier contracts until the revolution triumphs?
" We need to get rid of money entirely." Has any here looked into the Venus Project? With a resource based economy we should be able to get past this money issue smoothly. They plan to , paper cash that is. We will have an id card or chip. It will be sold to us as a way to prevent identity theft. They are sneaking it in for medical, pet tracking and elderly. Even IBM is promoting it now. Money is trade, however if you want a pie and I want an axe, how do we trade if I don't make pies?You make knives not axes? I make pizzas not pies, they are close but not the same. Therefore no trade. Money was invented to solve the problem. The money represents value of pie or pizza or axe or anything you want it to be. Then it is based on an assigned value. BANKS have to go, not money. Market commodities and trade in that sense has to go, or at least be rebuilt. Maybe you should just move to a country that has no money. Does that make sense? No. Neither does getting rid of money entirely. If you want to make changes at least try to aim for something that could actually be possible. "Neither does getting rid of money entirely." So, you can't envision a society without money? That is very, very sad to me that people are so dependent upon materialistic objects that have no true value. ...Not only are the protests and their US-funded leadership illegtimate, but by shamelessly twisting public perception to see them as anything but foreign-funded sedition, the corporate media has once again failed the public in pursuit of carrying out Wall Street and London's corporate-financier driven agenda. Beware of these revisionists and the increasingly unsubstantiated, even flat-out ridiculous claims being made by the media. Name names, follow the affiliations, research the organizations, click on "About Us," follow the money, and discover the truth the corporate media is willfully hiding from the public. Expose both this duplicitous agenda being pursued in Russia, as well as the disingenuous liars throughout the Western media's press peddling it. And above all, boycott and replace the corporate interests driving this agenda to begin with. Thank you. I have suspected that the protests were alot about US efforts to destabilize Russia and bring back the bad old days of Yeltsinite kleptocracy. So this whole thing about getting money out of politics is just a sham, right? Unions are masters at using money to influence the political process. Dang, they're so good at it that they've figured out a legal way to use money from people who don't even agree with the political causes they are being forced to support. Gotta admire their system. But you can't run around claiming that you are opposed to money in politics while you cozy up to unions who specialize in the purchase of politicians. Credibility goes out the window, people. You appear to be just fine with money in politics when it is flowing to your side of the aisle. Please do not assume that we are too stupid to see that. Overall, I think you are being consistent. Sadly, as you can see in shule's post below, you don't speak for the whole movement. And as long as obvious hypocrisy like this dominates the rhetoric, OWS will be a fringe movement largely ignored by the average person. Credibility is the coin of the realm, and OWS is losing valuable coin by saying one thing to it's enemies, an something entirely different to it's friends. Sorry, but common sense will not be tolerated here. Money is just a tool. It depends how money is being used. If it is being used to power the 1% that is obviously bad, but if money is being used to empower the 99% that is good. It only makes sense. You must be a troll. Large amounts of money that is ostensibly being used to empower the 99% will almost always be used to co-opt the movement and force it in a different direction. If we want to make something happen, we have to do it by ourselves. Letting someone elses money into our politics, even if it seems to support the people, will give them undue control over us and ruin everything this movement is about. Absolutely true! Whenever one borrows or uses somebody else's money there are obvious strings attached to that money. A loaner always has power over a borrower. I think that is a basic root of the problem that has got our country in the situation we are in; all that indebtedness. However, if we took our own money, pooled it, and used it to achieve some civic purpose, then there are no strings, and thus no problem. First thing though, it would be wise for all of us as individuals to adjust our lifestyles in manners that will keep us out of debt, or get out of debt if we are already in it. Anyone who disagrees is a troll? Anyone who points out your flaws is a troll? You guys are trying to perform a hostile takeover of this country and you will not succeed, because way too many people disagree with you. Fine, just so people are clear about what they really oppose. "Money on our side is OK, money on their side is not.". If that is the position, and you state it pretty clearly, then enough with the high and mighty "get money out of politics" line that we see and hear so much about. Troll or not, I know hypocrisy when I see it, and someone who says money doesn't belong in politics, and then posts what you just did, is speaking out of both sides of their mouth. Don't see the hypocrisy. Of course I think we all would be better off not having money in politics, but if one side is going to play the dirty game, using money to bribe and corrupt to get legislation favorable to a few, then it should not be unexpected for the other side to counter with money the best they can to get legislation favorable to the many. The request is clear; get money out of politics, but if the corps, banksters, etc. continue to use their money to do their thing, don't expect the unions, environmental, and other civic minded organizations to not use money to do their thing. It all come down to who are you for. So, you admit you're a troll? Give me a break. You know very well that corporations could use the exact same argument, in which case every stays just the way it is. OWS is trying to "purify" politics from the corrupting influence of money, as long as only the other side gets purified. Amid all the calls for the end of political donations by corporations, not a word about unions. I realize you don't see the hypocrisy, even though you spelled it out so clearly your post above - neither does the rest of the movement. But much of the country does, which explains the free fall of OWS in the polls. As for my trollhood, I've never heard the word until these last few weeks, so I don't know if I'm qualified for the label or not. It looks like it's often used to smear people who disagree with you, or bring up issues you can't refute. If so, then it looks like OWS is all about free expression in public parks, but not in public forums on the Internet. Again, a nasty little double standard. But I guess I'm getting used to that on these pages. Not all unions donate to political parties although the largest ones obviously do. I belonged to a construction union back in the eighties that wasn't a political donor.